Please join us at the Facility for Arts Reasearch (FAR) for a Closing Reception & Special Guest Lecture! Bridget Elmer, Allison Milham, Michelle Ray, and AB Gorham. 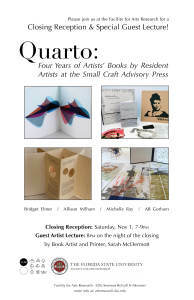 The closing reception will take place on Saturday, November 1st, 7-9PM. The guest artist lecture will be at 8PM on the same night of the closing reception by Book Artist and Printer, Sarah McDermott.